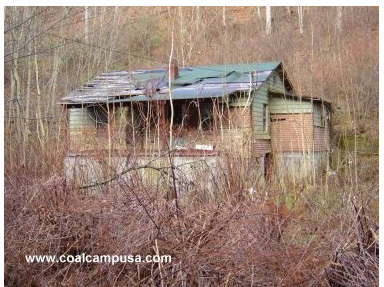 The abandoned coal camp house was probably built by the Anchor Coal Co. in High Coal, WV. The coal mine has shut down, and the town, which used to be just down the hill from the Seng Creek Tunnel, has almost totally returned to nature. Click here for stories about Billy Edd’s childhood in a coal camp. 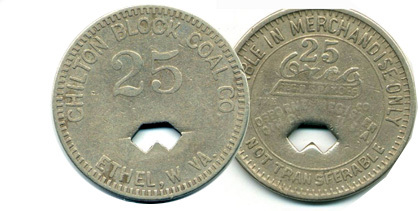 In the early 1900s, the miners who worked at coal camps were paid in scrip. The miners and their families could spend their scrip at the company store, but it was worthless outside the coal camp. This scrip comes from the Chilton Block Coal Company in Ethel, West Virginia. Vocabulary: coal camp, miners helmet, scrip, strip mine, holler, mine fans, tipple. • Have students read the Billy Edd stories aloud. A different student reads each paragraph, while all students underline things he says or tells about what they think are important. Afterwards: Have students tell what they underlined and why. • Imagine this: You are grown up. You live somewhere else now. You decide you want to visit the place in West Virginia where you live now. You want to see it. But you can’t find it. It’s not there. The houses and churches and stores and school aren’t there anymore. The place where you used to live and play is all grown over with ivy and vines. All the roads are gone. You can’t even find where your home used to be. 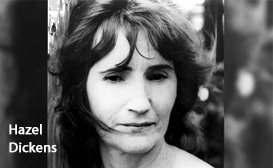 Imagine and write a story in which that happens. This writing exercise could set up a project on coal and timber camps that were totally owned by companies. How could somebody’s hometown disappear? It happened to Billy Edd Wheeler and hundreds of thousands of West Virginians who lived in coal camps before 1960. They would be your grandparents’ or great-grandparents’ age now. At the same time, big timber camps were set up by timber companies. Many are gone now. Steel towns have changed. Could that happen now? If not, why not? How is High Coal different from your town? • In what ways has your life been like Billy Edd’s childhood in High Coal? How has it been different? Billy Edd told about games he and his buddies played in High Coal. What games do you play? What do you do that does not cost money? What chores do you do? • Read Billy Edd’s story about Mr. Hudson. “He was an honorable man,” Billy Edd said. “He had a big impression on me.” What did Mr. Hudson do that made such an impression on him? Do you agree with Mr. Hudson? Why or why not? • Listen to High Flying Bird. When young Billy Edd was having trouble with his stepfather, he used to look at the birds and wish he could fly away too. 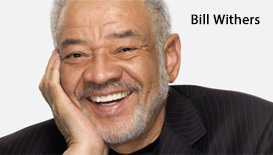 When he grew up, he wrote High Flying Bird. 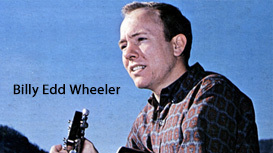 Listen to the Jefferson Airplane’s version, Richie Havens’s version, and Billy Edd’s own version. Which is your favorite? Why? • Choose the lyrics to two of Billy Edd’s songs. Write about the way he used experiences from his life to write them. • Use Billy Edd’s painting for a coal camp lesson. Company store, tipple, railroad tracks. Draw a map of your neighborhood or town. Grammar: Quotation marks. Use of double quote marks, single quote marks. When do you use each?